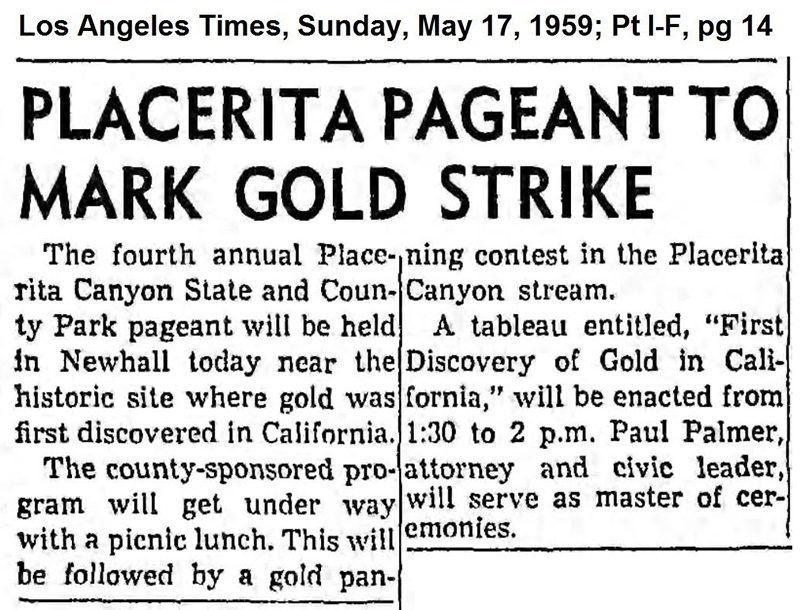 May 17, 1959 — The fourth annual Placerita State and County Park Pageant included a reenactment of the romanticized version of Francisco Lopez's discovery of gold in Placerita Canyon in 1842. Second from left is retired L.A. County Sheriff Eugene W. Biscailuz. Far right, serving as master of ceremonies, is Paul Palmer, a Sand Canyon resident and Los Angeles-area attorney who was involved in the deal that brought the Placerita parkland into public ownership. (Paul Palmer was father to Paula Palmer, who married Leona Cox's son Clem.) One of he other men is probably Ross Lopez, a Francisco Lopez descendant. Grave of Lopez, Gold Discoverer, Hunted. Los Angeles Times | March 8, 1959. Tomorrow is the 117th anniversary of the discovery of gold in California and the occasion has started a new search. 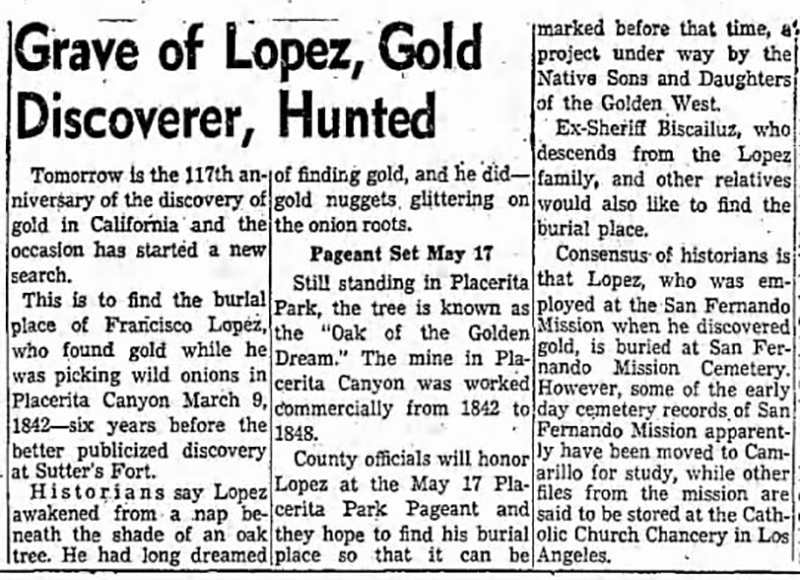 This is to find the burial place of Francisco Lopez, who found gold while he was picking wild onions in Placerita Canyon March 9, 1842 — six years before the better publicized discovery at Sutter's Fort. Historians say Lopez awakened from a nap beneath the shade of an oak tree. He had long dreamed of finding gold, and lie did — gold nuggets glittering on the onion roots. Still standing in Placerita Park, the tree is known as the "Oak of the Golden Dream." The mine in Placerita Canyon was worked commercially from 1842 to 1848. County officials will honor Lopez at the May 17 Placerita Park Pageant and they hope to find his burial place so that it can be marked before that time, a project under way by the Native Sons and Daughters of the Golden West. Ex-Sheriff Biscailuz, who descends from the Lopez family, and other relatives would also like to find the burial place. Consensus of historians is that Lopez, who was employed at the San Fernando Mission when he discovered gold, is buried at San Fernando Mission Cemetery. However, some of the early day cemetery records of San Fernando Mission apparently have been moved to Camarillo for study, while other files from the mission are said to be stored at the Catholic Church Chancery in Los Angeles. 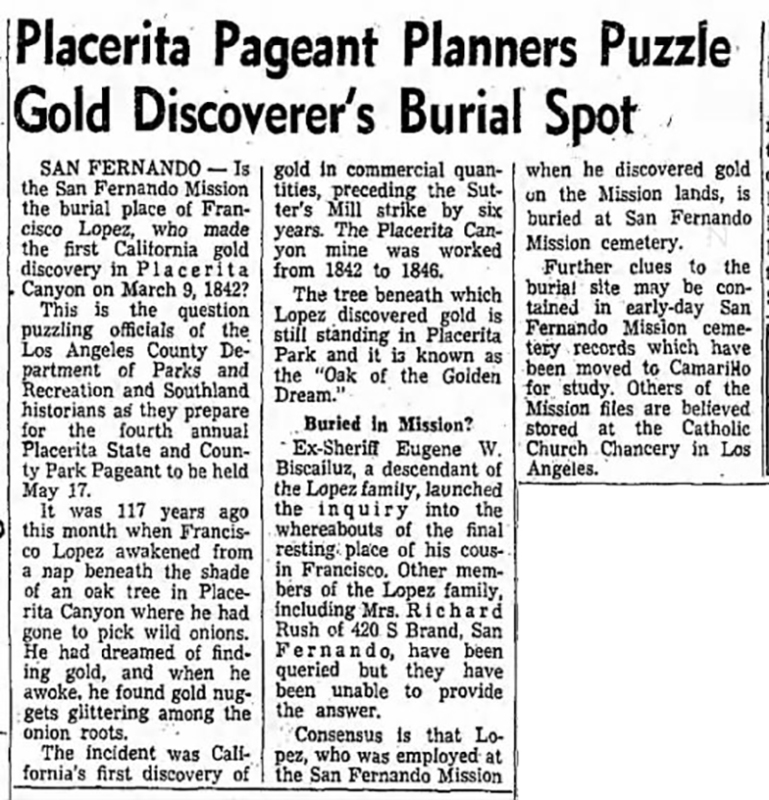 Placerita Pageant Planners Puzzle Gold Discoverer's Burial Spot. Los Angeles Times | March 22, 1959. San Fernando — Is the San Fernando Mission the burial place of Francisco Lopez, who made the first California gold discovery in Placerita Canyon on March 9, 1842? This is the question puzzling officials of the Los Angeles County Department of Parks and Recreation and Southland historians as they prepare for the fourth annual Placerita State and County Park Pageant to he held May 17. It was 117 years ago this month when Francisco Lopez awakened from a nap beneath the shade of an oak tree in Placerita Canyon where he had gone to pick wild onions. He had dreamed of finding gold, and when he awoke, he found gold nuggets glittering among the onion roots. The incident was California's first discovery of gold in commercial quantities, preceding the Sutter's Mill strike by six years. The Placerita Canyon mine was worked from 1842 to 1846. 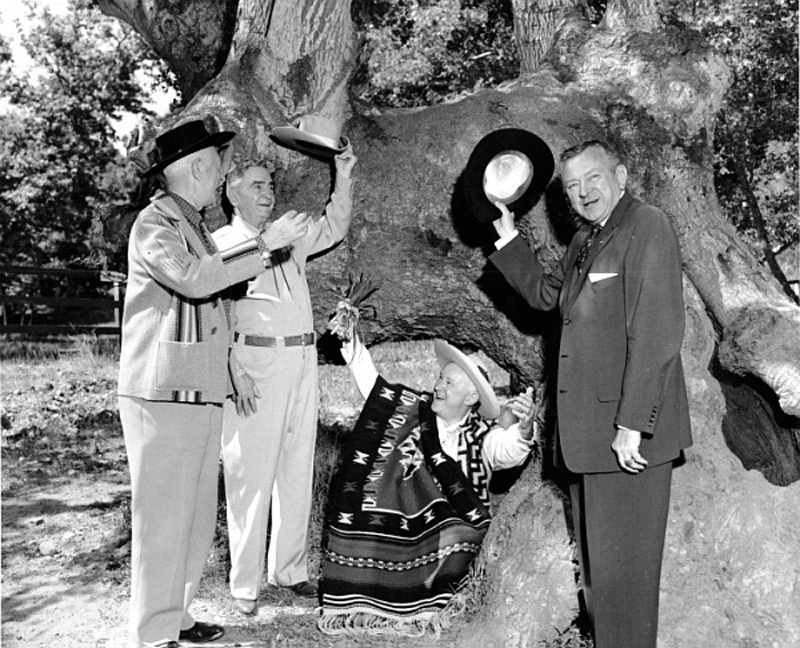 The tree beneath which Lopez discovered gold is still standing in Placerita Park and it is known as the "Oak of the Golden Dream." Ex-Sheriff Eugene W. Biscailuz, a descendant of the Lopez family, launched the inquiry into the whereabouts of the final resting place of his cousin Francisco. Other members of the Lopez family, including Mrs. Richard Rush of 420 S Brand, San Fernando, have been queried but they have been unable to provide the answer. Consensus is that Lopez, who was employed at the San Fernando Mission when he discovered gold on the Mission lands, is buried at San Fernando Mission cemetery. Further clues to the burial site may be contained in early-day San Fernando Mission cemetery records which have been moved to Camarillo for study. Others of the Mission files are believed stored at the Catholic Church Chancery in Los Angeles. Placerita Pageant Planned for Sunday. Los Angeles Times | Monday, May 11, 1959. 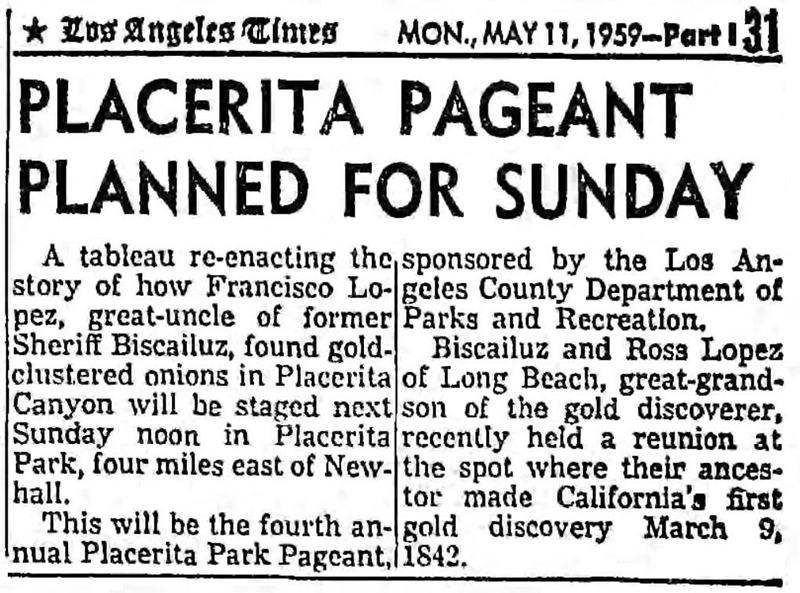 A tableau re-enacting the story of how Francisco Lopez, great-uncle of former Sheriff Biscailuz, found gold-clustered onions in Placerita Canyon will be staged next Sunday noon in Placerita Park, four miles east of Newhall. This will be the fourth annual Placerita Park Pageant, sponsored by the Loa Angeles County Department of Parks and Recreation. Biscailuz and Ross Lopez of Long Beach, great-grandson of the gold discoverer, recently held a reunion at the spot where their ancestor made California's first gold discovery March 9, 1842. Placerita Pageant to Mark Gold Strike. Los Angeles Times | Sunday, May 17, 1959. The fourth annual Placerita Canyon State and County Park pageant will be held in Newhall today near the historic site where gold was first discovered in California. The county-sponsored program will get under way with a picnic lunch. This will be followed by a gold panning contest in the Placerita Canyon stream. A tableau entitled, "First Discovery of Gold in California," will be enacted from 1:30 to 2 p.m. Paul Palmer, attorney and civic leader, will serve as master of ceremonies. Fete Honors Discovery of Gold Here. Los Angeles Times | May 18, 1959. Square dancers and young gold panners gathered at Placerita Canyon Park east of Newhall yesterday for the fourth annual pageant memorializing the first gold discovery in California. The event, sponsored by the county's Department of Parks and Recreation, included games, burro races, exhibition dances and a gold panning contest. The pageant's historical significance goes back to 1842, when Francisco lopez found nuggets between the roots of an oak tree in Placerita canyon. Francisco's great-grandson, Ross Lopez of Long Beach, was a guest yesterday. 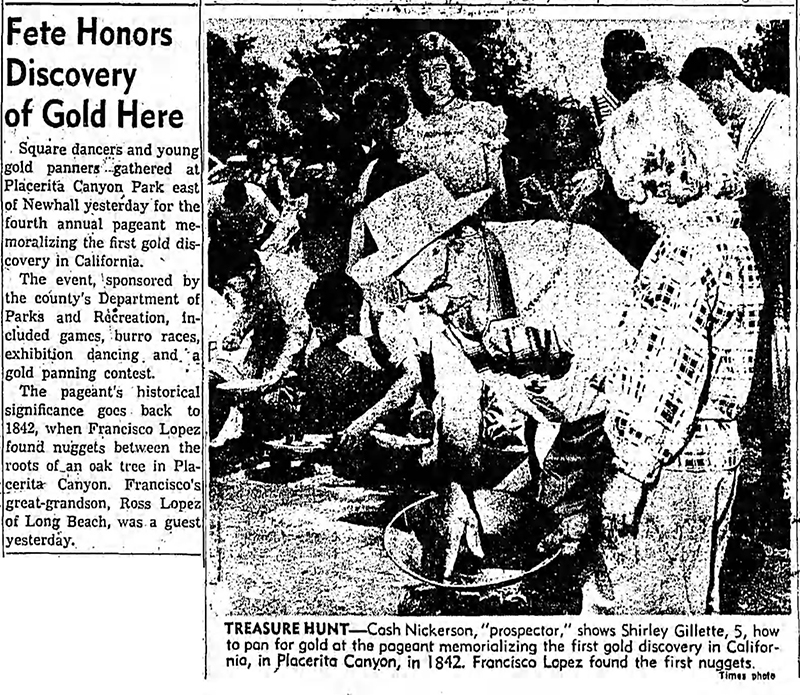 Treasure Hunt — Cash Nickerson, "prospector," shows Shirley Gillette, 5, how to pan for gold at the pageant memorializing the first gold discovery in California, in Placerita Canyon, in 1842. Francisco Lopez found the first nuggets. CC5901: 2400 dpi jpeg from original photograph.